Our trip began as a daydream. The damp, late winter of Seattle had left us craving dry heat, cool desert hues and long, dusty roads. After much discussion about how to make our dreams reality, we finally booked our flights and camper van rental in Southern California, where our journey was due to begin. This two part travel special is told by friend and contributor Kaitlin Ardnt, about her trip with photographer Lonnie Webb. On our first night after arriving in Orange County, we met up with Lon’s friend Sean Woolsey and his wife Sara, who were gracious enough to allow us park our Eurovan in their driveway and “camp” for the night. After grabbing coffee and breakfast with Sean in the morning, we departed from Costa Mesa and headed in the direction of Las Vegas, NV. We’d never been to Vegas before, nor had we ever had the urge, so our Southwestern road trip was the perfect excuse to stop by, cruise the strip and see what the hype is about. After coming to the conclusion Vegas is essentially Disneyland for adults, we won’t be planning a return trip, but we might be tempted back by the thought of devouring another bacon burger and chocolate peanut butter milkshake from Shake Shack, because—wow! Our original itinerary required us to spend only 30 minutes in Vegas, which, in reality, turned into a few hours. The sun would be setting soon, hopefully allowing us some relief from the 102°F heat. We still wanted to see Red Rock Canyon, and our navigation told us it was only about a 15-minute drive west of where we were. As we distanced ourselves from the craziness of the city, I felt immediately calm and relieved of any anxiety. This is what we were seeking: peace in the beautiful, natural surroundings of a brand­-new-­to-­us place. Our timing was perfect—for the sunset, anyway. The park ranger told us there was no camping for 150 miles around us, so we had absolutely no idea where we would be camping that night. But that was okay, because Lonnie ended up proposing that evening in the dusky, desert glow of the canyon, capturing it all on photo and video. After that moment, we both could have cared less about any problems or challenges. Our first day on the road came to a close late that evening as we rolled into a 24­-hour Wal-Mart parking lot, ate McDonald’s for our first meal as an engaged couple and parked for the night. Despite winding around the vast, maze-like park, we found no available campsites – everything was full. Passing elk along each side of the road, we exited the national park and entered an RV park. Lucky for us, our ‘99 VW Eurovan fit right in and we found an open campsite. 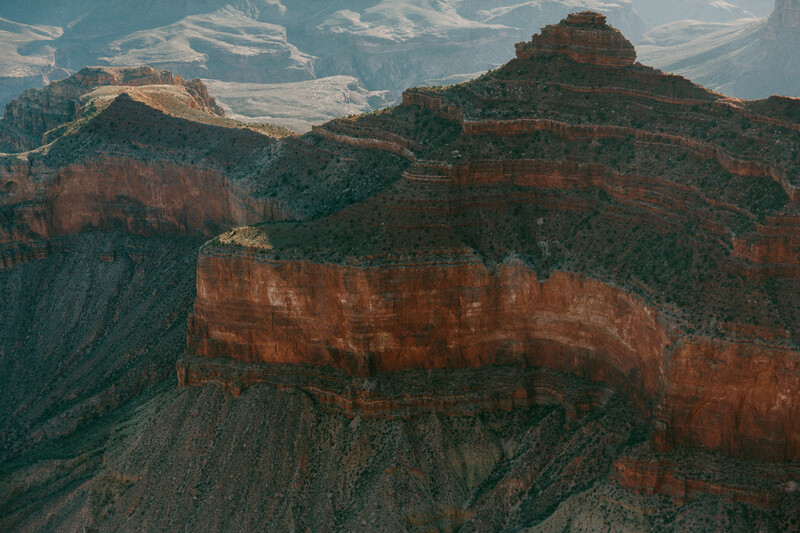 We set up camp, had the most peaceful night’s sleep in the cold mountain air and woke up at sunrise to experience, in awe, the unparalleled beauty of the Grand Canyon. We set up camp, had the most peaceful night’s sleep in the cold mountain air and woke up at sunrise to experience, in awe, the unparalleled beauty of the Grand Canyon. After breakfast burritos and iced coffee, we were back on the road to Flagstaff, AZ. I initially loved Flagstaff. The drive through Coconino National Forest was stunning, and I had high hopes for the potential thrifting and pawn-shop jewelry hunting I had been told about. We left all thrift shops empty-handed and disappointed, and the pawn shops had moved or gone out of business. Just shy of midday, we continued south down Highway 17 to Sedona. We had been looking forward to seeing Sedona, AZ, since everyone we told about the route of our trip reassured us that Sedona would not disappoint. As we wound down and around Oak Creek Canyon, the beauty grew with the height of the ponderosa pines. The breeze was refreshing through the pockets of shade, cool creek water in the air providing noticeable relief. As the van rounded a bend in the road, I yelled for Lon to “TURN HERE!” and he whipped into a gravel parking lot of a nondescript Dairy Queen. I had been told about this specific Dairy Queen location; there were about 10 -12 small jewelry booths set up there, all selling authentic handmade Native American natural stone and silver rings, bracelets and necklaces. I found a beautiful, dainty turquoise ring with 3 small stones set in sterling silver. Of course, we couldn’t pass up ice cream on a hot day, so after enjoying a treat, we headed back onto the road to find camp. Just a few miles from the city, we found the perfect campsite (with showers!) under a canopy of pines, parallel to a looming wall of red rocks. Settled in at our new camp, we enjoyed beers and strolled along trails surrounded by lush green ferns and other familiar vegetation. We found ourselves especially comfortable, even in a place so new and far from our real home. Dusk fell and the campfire blazed as our wedding and future family vacations were eagerly planned, inspired by this trip. I think that was the night we both had the best, most peaceful sleep. At this point, we hadn’t bathed in almost six days, aside from wiping the top layer of dirt from our skin every night with baby wipes. I was so excited about showering that morning. We brushed our teeth and made small talk with neighboring campers (everyone in Arizona is so nice! ), and realized how bad we had actually smelled before taking that much-needed shower. We said our goodbyes to camp and made our winding way to Slide Rock State Park. The rocks were incredible—in size, color, shape, scale, everything. The landscape was like nothing we had ever seen; it almost felt like it wasn’t real. The park was nestled just below massive red-­orange rocks, glowing in the harsh morning sun. It was already 90°F by mid-morning, so it was a good thing that we found ourselves a natural waterslide park—icy cold water included. The flat red rocks laid parallel to the shallow pools of water were perfect for dipping my feet. A few feet in, the rocky bottom of the pool fell away, deep enough for cliff jumping. Lon leapt in, but despite his efforts to persuade more than just my feet to come into the water, I stayed dry. After grabbing our new favorite coconut popsicles at the gift shop, along with a souvenir “Slide Rock State Park” coffee mug, we started up the van, A/C on full blast, to make our way into town. 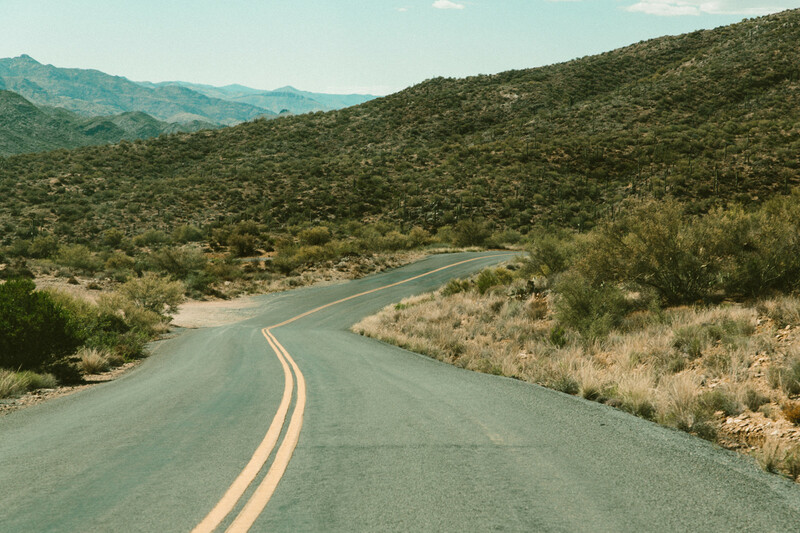 We explored some shops and drank fresh­ly squeezed lemonade, but came to the conclusion we loved Sedona for its natural beauty, not so much for the touristy shops and attractions. Just after lunchtime, we mapped how far we were from our next destination: Joshua Tree, CA. Five hours? Not too bad! Hoping we could make it to Indian Cove campground in the evening to snag the same site we stayed at two years ago, we were off. Hills and hills of saguaros. The Pacific Northwest equivalent would be mountainous forests of evergreens, and I was in awe of these massive cacti. Lonnie pulled off onto a road called Bumble Bee, where we ate peanut butter and jam sandwiches that I made in the van and the bread soon turned to toast from the arid heat of the afternoon. We had a view of hundreds of saguaros, miles of them stretching out before us. Naturally, this required capturing, so I took the wheel, allowing Lon to photograph everything as we zipped up and down the dusty hills. After a 45-minute-long “cactus freak out,” we got back on the highway south toward Phoenix, where we would meet up with Interstate 10 and drive west to Joshua Tree. We are still unsure what happened to cause this, but our navigation told us we still had another 5 hours to go before arriving at the campsite. It was an eternally long day of traveling, but we were driving west into the sunset, singing our favorite songs at the top of our lungs (badly) and eating popsicles—together. Thank you, Kaitlin and Lonnie, for inviting us along on your desert sojourn. Daydreaming of the Southwest? Check out the other parts of the Southwest Road Trip series and our wilderness adventures in California. And for more of our inspiring travel stories from contributors around the globe, see here.